Heel height 1.76 inches; Soft Leather; leather sole, round toeline, no appliqués, square heel, laminated effect, buckle, leather lining. Heel height 2.54 inches; Soft Leather; leather lining, buckle, snakeskin print, round toeline, laminated effect, solid colour, square heel. Heel height 3.71 inches; Soft Leather; leather sole, buckling ankle strap closure, sueded effect, round toeline, fringe, solid colour, leather lining. 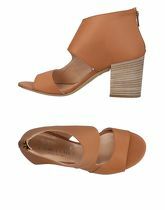 Heel height 2.93 inches; Soft Leather; geometric heel, solid colour, laminated effect, zip, leather, no appliqués, round toeline. Heel height 1.76 inches; Soft Leather; square heel, solid colour, print, buckle, laminated effect, glitter, round toeline. 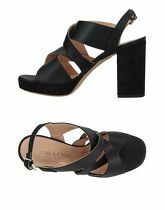 Heel height 1.76 inches; Soft Leather; leather lining, buckle, no appliqués, round toeline, varnished effect, solid colour, square heel. Heel height 2.54 inches; Soft Leather; leather lining, buckle, no appliqués, round toeline, suede effect, solid colour, square heel. Heel height 2.54 inches; Soft Leather; leather lining, buckle, no appliqués, round toeline, laminated effect, solid colour, square heel. Heel height 2.34 inches; Soft Leather; leather sole, round toeline, solid colour, square heel, print, buckle, leather lining. 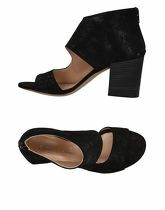 Heel height 1.76 inches; Soft Leather; leather sole, round toeline, solid colour, square heel, print, buckle, leather lining. Heel height 3.32 inches; Soft Leather; leather lining, buckle, metal applications, round toeline, suede effect, solid colour, square heel. Heel height 3.12 inches; Soft Leather; geometric heel, solid colour, laminated effect, buckle, leather, no appliqués, round toeline. Heel height 3.12 inches; Soft Leather; leather lining, zip, no appliqués, round toeline, leather, solid colour, geometric heel. Heel height 2.54 inches; Soft Leather; leather sole, round toeline, solid colour, square heel, print, buckle, leather lining.